Better performance, Reasonable price! Each pack includes 1 screw lid, 1 extra fine mesh cup, 1 saucer for avoiding making a mess when taking out. All the parts are made of 18/8 stainless steel. Odor & Chemical Free. Easy to clean and dishwasher safe. 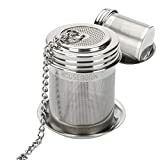 Unlike traditional tea ball or twist lid infuser, our tea strainer features threaded connection design that you'll feel easier to open and close when using. Besides it seals more tightly so tea leaves will not leak out during the process of brewing. 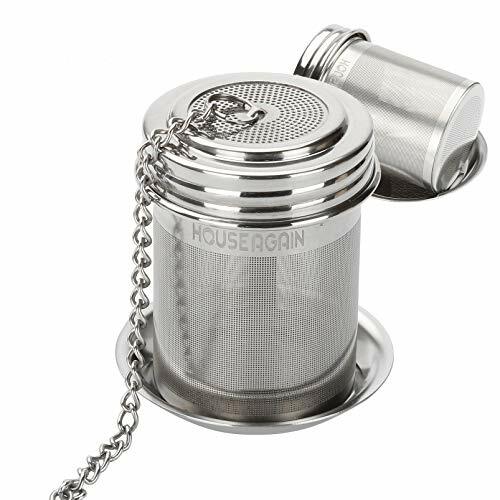 Extra fine mesh holes are designed to hold tealeaves, particles or grounds intact while allowing the flavor to drift out. Extended 4.7" chains. Fit nearly all the teapots, mugs or cups of different size. The HOUSE AGAIN Advantage: Professional tea filter maker. Multiple high-quality products for your choice. 30-DAY money back warranty and 24/7 friendly customer service.